We’ve looked at high profile names for whom the term ‘soft-skills’ could have been penned for but what about those in the limelight who struggle to reconcile the necessary public persona with their natural personality? 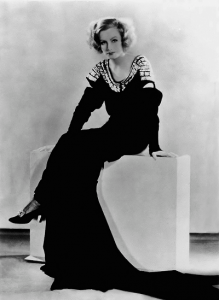 We take a look at iconic 20’s/30’s film star Greta Garbo. There are many stars who are immortalised by a single line delivered in glorious technicolour; de Niro’s “You talkin’ to me”, Humphrey Bogart’s “Here’s looking at you kid”, Patrick Swayze’s “Nobody puts Baby in a corner” and of course, Garbo’s “I want to be alone” back in 1932. There are very few stars, however, whose signature line sums up their personality quite so succinctly. Born Greta Gustafsson in Sweden on the 18 September 1905, Garbo was the darling of the burgeoning film industry for around 20 years before completely turning her back on fame. This was an unusual step, certainly by the standards of the celebrity culture of today, but perhaps in Garbo’s case one that was necessary to preserve or claw back her sense of self. Garbo had a modest, poor background so to say that she was unprepared to be thrust into an unfamiliar world when she was ‘discovered’ by director Mauritz Stiller and subsequently moulded into his ideal would be an understatement. Whilst this type of extreme modification of another’s personality and behaviour is thankfully not common within corporate settings, as managers we can be guilty of attempting to force staff into our own moulds in an attempt to produce a team of mini me’s ready and willing to do our bidding. And as individuals, our admiration for a strong leader can cause us to emulate their soft skills style; their ways of behaving and interacting with others through vocabulary, mannerisms, tone and so forth. The difficulty with trying to be someone that you are not (or forcing another to do so) is that very often it just doesn’t feel authentic. Like picking up a pair of shoes from the lost property cupboard, the sizing isn’t quite right. For Garbo, being a gifted actress, she was able to pull off the new svelte figure, name, styling and dictates on what to say and think with apparent ease, but for most of us, that we are wearing another’s shoes will be immediately obvious. Being young and innocent or not immediately exhibiting the characteristics that Stiller so desired of his young star, perhaps Garbo did require a little development in her soft skills but the leap she made was evidently too much, too soon. And what can Garbo’s experience teach us? It is unlikely that your plan is to debut on the big screen, you might however feel that your soft skills need an update. Maybe you’d like to deliver presentations with more personality or simply be able to make curmudgeonly Ken in the office crack a smile once in a while, the advice would be to go for it, but keep it authentic. If you’re naturally quiet, aim for quietly authoritative, if you struggle with public speaking work on pace and speed to subtly amend your natural delivery, if you find small talk difficult practice it with friends and colleagues before you have to engage in networking events. Greta Garbo sadly passed away in New York City on the 15th April 1990, aged 84, after 50 years out of the public eye, even eschewing picking up an honorary Oscar in 1955, not an occasion many would miss out on! For Garbo the demands of fame became a price that she was unwilling to pay. It is possible to improve your soft skills, it is even possible to morph them into something so unrecognisable that they become exhausting and impossible to maintain. But to be your best self, remember to keep it authentic.